Place of Rescue. When visiting Place of Rescue for the first time one can easily be drawn into thinking that this is an idyllic home, a place filled with perfect children laughing and happy smiling grannies with wide (almost toothless!) grins. But beneath the laughter and wide grins Place of Rescue is foremost a haven, an oasis in a world that can be hard, cold-hearted and mean. The fact is, here one encounters children who have overcome abandonment, grannies who are alone after losing their grown children to AIDS and entire families who live under the daily shadow of HIV/AIDS. But love also lives here. Jesus demonstrated this love in His sacrifice for all and Marie Ens and her faithful fellow administrators, staff, house moms and teachers at Rescue are here to live it out to each orphaned child, each lonely granny and each mother and father with HIV/AIDS living in a hospice home. Marie, referred to affectionately as “Grandma”, and her house moms have worked hard to create a family environment for each of the children. As the house moms take the place of the children’s biological parents, they face all the challenges and phases of parenting and so in the coming days, Place of Rescue is moving toward a new phase of its life-cycle: some of its children are growing up. Growing Up. The hardest moments of parenting are often the times of letting go, to see children move step by step and year by year toward independence and self sufficiency. Have you done all you could to teach them about life? Can you continue to help them transition into adulthood and responsible living? For the children at Rescue, a major marker to indicate the time to transition away from the orphanage is not one of age but high school graduation. Since many children at Rescue start proper education at a later age, many stay at Rescue beyond the typical ages of 18-19 for high-school graduation. So as this milestone is being met by the older children, Rescue is working to find an appropriate level and means of continued support and guidance. A Transition Home. One answer will be a new Transition Home, an extension of Place of Rescue orphanage in the city of Phnom Penh where high school graduates will live in community while attending university or vocational training school. With greater independence but having the oversight of house parents, it is hoped that the Transition Home will be a helpful bridge between living at the orphanage and living with complete independence. Rescue has purchased a property in the capital that contained two houses, one which was demolished and one which has been renovated as a Guest House. For our week in Cambodia, the eMi team stayed in the Guest House and designed a Transition Home for the empty portion of the property. Our team met with a local contractor and structural engineer to gather information about local construction practices, building code issues and to understand construction scheduling and cost estimation for budgeting purposes. 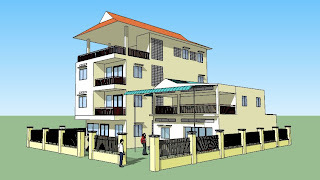 The product of our team’s efforts is a 23-bed, four-level residence. There are areas for group social activities as well as quiet spaces for individuals. A spacious kitchen allows for group meal preparation. After viewing numerous local buildings under construction, the team is confident the design is one which fits well into the local context, will maximize natural cooling in the hot, muggy weather and will provide good rain and wind protection during the thunderous storms of the rainy season. Our final evening in Phnom Penh was spent presenting our design and sharing a meal with Marie in her home along with the Place of Rescue executive staff. We also spent time with the children once again, some of whom were comfortable enough with us for rides on our shoulders. What a privilege to give of our skills and resources for the future of these beautiful children. Project Photo. A new set of photos has been placed in my Photo Gallery for this project, so click here (Photo Gallery) and see the Place of Rescue set with a slideshow (click the middle of the photo for commentary). If you want to spend a little more time looking and reading, click here in Details (Photo Details). Check these out along with the project video on my side bar and see what your support, encouragement and prayer have produced in the work of this team. "Thank you" to all our prayer and financial supporters for making this project a reality.